...........but I thought it'd be a good idea to list them all in one place for convenience. ...........This webpage must be one of the best tips in the whole website!! 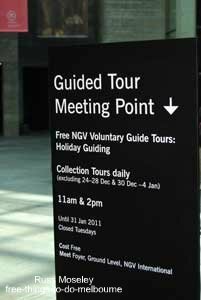 There are daily tours at both of the NGV buildings - NGV International and Ian Potter Centre: NGV Australia. The NGV International has the international art and the Ian Potter Centre has all the Australian art. There's so many galleries in these two buildings (66,000 works of art in total) that guided tours and times change constantly. So you'll need to find out what's on by clicking on NGV. It's a very user unfriendly website though - driven me bananas a few times! Locations: Ian Potter Centre:NGV Australia is in Federation Square, NGV International is just past the Arts Centre spire in St Kilda Road. Both are open 10am - 5pm daily except Xmas day. If you're into contemporary art then this is the place for you! This is a leading contemporary art gallery with displays of both national and international artists. 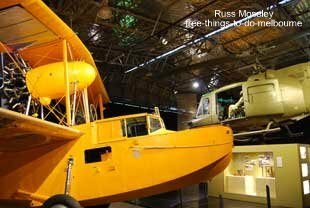 .....They vary depending on the exhibits currently on display - they change regularly - it's not a museum with a permanent display. You can go on a free talk and tour of every exhibition. The ACCA is located in one of Melbourne's most unusual contemporary buildings, just five minutes walk from NGV International at 111 Sturt Street, Southbank. It's open Tues-Fri 10-5pm and Sat/Sun 11-6pm. The Shrine of Remembrance is definitely one of the top ten places to visit in Melbourne. 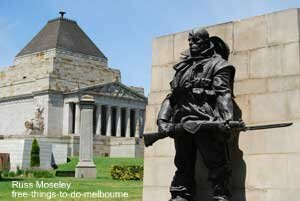 It's Victoria's most visited war memorial and apparently one of Melbourne's most recognised landmarks. Inspired by one of the Seven Wonders of the Ancient World, it was completed in 1934. 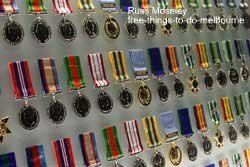 There's a lot to see here - two galleries with changing exhibitions, medals, regimental items, The Stone of Remembrance and a Ray of Light Ceremony. The Ray of Light Ceremony copies a naturally occuring feature which happens at 11am on 11th November every year (when it's sunny!). It's really interesting watching this Ceremony - quite moving. It's on every half hour. ......I'm definitely going to do the tour next time I visit. The Shrine's located on St Kilda Road/Birdwood Avenue, South Yarra - close to the main entrance to Royal Botanic Gardens. It's a 10-15 minute walk from Flinders Street railway station. Melbourne Town Hall is one of those places that should be on everybody's list to visit but I haven't yet met a Melburnian who's been there. It's an impressive building with a superb wood panelled Council Chamber and four or five wonderfully ornate high ceiling rooms. You can go on guided tours between 11am and 1pm weekdays. Tours last an hour. Numbers are limited so bookings are essential and required at least one day in advance. Tel (03) 9658 9658. 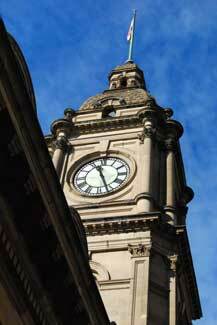 It's located on the corner of Swanston and Collins Streets, Melbourne. .......The building itself is worth a thorough investigation. It's made up of 23 buildings constructed over a long period, beginning in 1854. 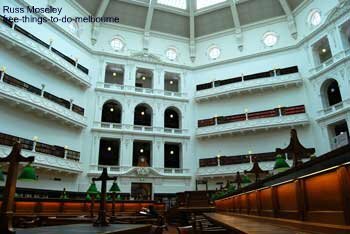 You'll find items of architectural interest in most of the rooms, from panes of stained glass to murals and marble staircases, many original architectural features and - my favourite - the famous la Trobe Reading Room. 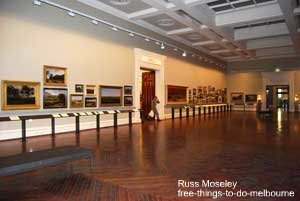 There's also a number of galleries providing permanent and changing art exhibitions all relating to Victoria in some way. There are daily free guided tours including of the La Trobe Reading Room and the artworks. The library is located at 328 Swanston Street, right opposite Melbourne Central. It's open Mon-Thur 10am-9pm and Fri-Sun 10am-6pm. Tel (03) 8664 7099 for times and range of tours or click State Library. Parliament House is one of Australia's oldest and most architecturally distinguished public buildings. Building started in 1856 at the height of the gold rush when money was no object. You can see this by the lavish use of gold inside. 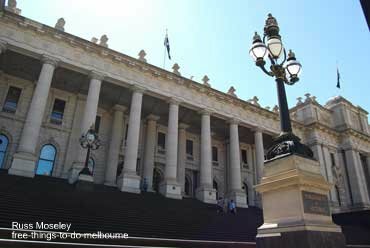 You can read an account of my guided tour in Parliament of Victoria. Guided tours take place on days when Parliament is not sitting (which is actually the majority of the year!). Guided tours take place at 9.30am, 10.30am, 11.30am, 1.30pm, 2.30pm and 3.45pm. 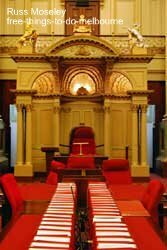 They take about 45 minutes and you get the chance to sit in the Premier's and Speaker's chairs! You just turn up and queue for a tour. There was no queue when I turned up - I was able to walk straight in. On the days that Parliament is sitting, you can watch Parliament in action. Parliament House is located on Spring Street opposite the Windsor Hotel. You can get a free guided tour of this very popular park. There's a lot of things to see. 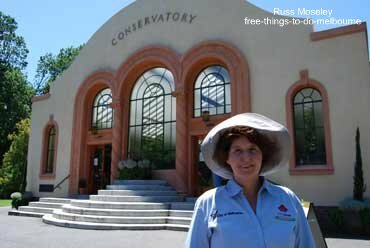 This is a photo of Sue who was my guide at the time, outside the gorgeous Conservatory. I think the tour was then run by the city of Melbourne but I've just had an email to say that the tour is now run by Serco the gardeners on Saturdays at 10am. 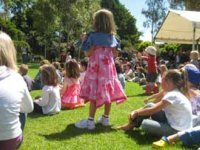 The meeting spot for this is now at the flag located outside the Fitzroy Gardens Visitor Centre, across from Cooks' Cottage in the south of the garden, off Wellington Parade (tram stop 10). No advance booking is required. ......It's of Spanish Mission architectural style constructed in 1930. .... the displays are changed five times a year so it always looks fresh. It's a popular wedding photography location. 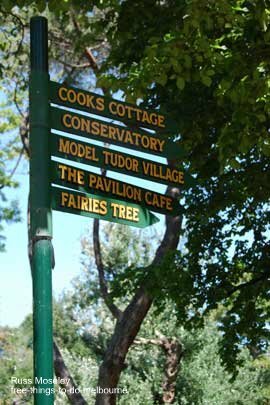 ....over to the Fairies Tree, miniature English Tudor village and to one of the fountains. Carolien recently emailed me about the new tour company saying "Excellent guide. Most enjoyable". So make a date in that diary! 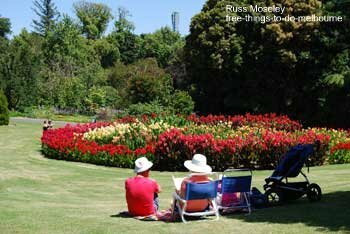 Fitzroy Gardens is located off Wellington Parade by Lansdowne Street. Go on a free Discovery Walk exploring the lovely Royal Botanic Gardens with it's English landscape and diverse plant collections. ...... I can assure you that the guided tours are highly interesting and you'll see things you wouldn't notice strolling around alone. The guided tours leave from the Visitor Centre at the Observatory Gate. Tours are every Tuesday-Sunday at 11am and 2pm and are one and a half hours long. 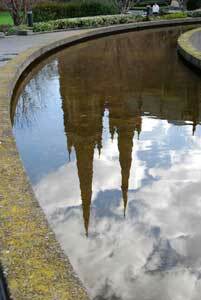 These photos were not taken on the tour in case you are wondering - no deckchairs included! Tours are held year round. See Royal Botanic Gardens for more details. .... Don't make the same mistake!! It's a great museum and is staffed by volunteers so I would expect it to be a good tour. Tip: Make sure you go on one of the 'flying' days - Tuesdays, Thursdays and Sundays at 1pm. Tours are available from Tuesday to Friday. Last tour is 1.30pm. To book, call the Administration Officer on (03) 92561300. 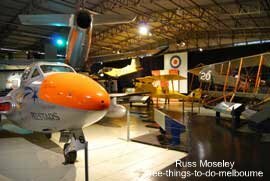 Have a look at what I thought of the Museum at RAAF Museum. The location is Point Cook Road, Point Cook. 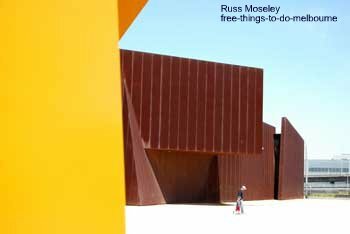 It's open Tues-Fri 10am-3pm, weekends and public holidays 10am-5pm. (All visitors over 16 need photo ID). 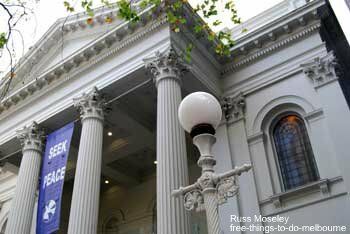 Held in July, Melbourne Open House provides a rare opportunity to discover buildings that are not normally open to the public - some are old, some new, some in-between but most are interesting. Only 60 buildings were open for inspection when I first went. Now there are over 200. ......I'll add a few after this years event!! ......This weekend is busy so you'll need to find the building list and make bookings as soon as you can, otherwise the book-in-advance tours are likely to be full. Check for details on Melbourne Open House. I was passing when an organ recital was about to start so have been in and had a look around but haven't actually been on a tour. ......I'll be going soon myself so maybe see you there! Guided tours are available between 10.30 and 1pm. Location is 120 Collins Street. .....and finally - though probably the most important - don't forget the Melbourne Greeter Service if you're a visitor to Melbourne. 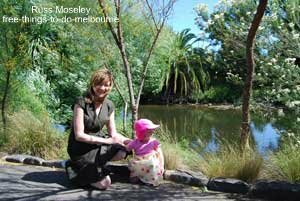 A local volunteer will take you around Melbourne for a two to four hour trip showing you the sights - for free - what could be better?!! Read about my trip at Melbourne Greeter Service. Make sure you call up and arrange an 'orientation'. You need to book in advance - call (03) 9658 9658 or ask at the Melbourne Visitor Centre in Federation Square. It's available in 8 languages - English, Swedish, German, French, Dutch, Italian, Spanish and Japanese. 24 hours notice is required. The meeting point is the Melbourne Visitor Centre.